Merrythought has been hand-making the English teddy bear in the United Kingdom, since 1930 and is now the last remaining British teddy bear manufacturer. 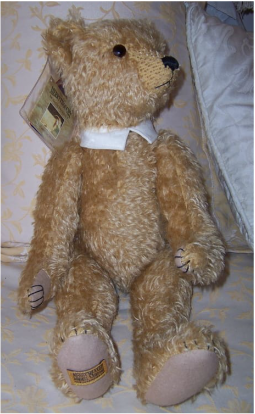 This teddy bear was hand made in England by Merrythought, Britains finest soft toy manufacturer. He comes with his original clear plastic pouch hangtag to his ear, stitched tag to bottom of his foot, stitched fabric tag to side of his body. The clear plastic pouch contains a leaflet about the mohair story, and on the front is the Limited Edition Certificate. The print is quite faint and just able to be read with help of a magnifying glass. Theodore is a L/E No. 131/750 and was commissioned to celebrate 100 years of the teddy bear and was named after the US President Theodore Roosevelt in 1902. He is in wonderful unplayed condition, and appears almost like new.